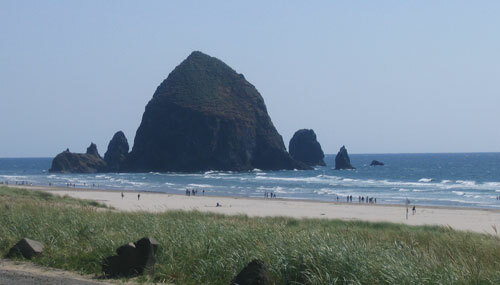 Haystack Rock is a great destination and site to see if you are visiting near Cannon Beach. Located on the North Coast in Clatsop County Cannon Beach is a popular destination for vacationers from portland Oregon. There is many great places to stay and places to eat in cannon Beach and has a large commercial area downtown with all kinds of fun shops to explore. However, the big site to see in Cannon Beach is Haystack Rock a beautiful marine ecosystem that is fun to explore on a lowtide. Check a tide tables and take a nice walk on the beach during the low tide and you can explore the surrounding rocks and tide pools that when receded reveal starfish, sea anemone’s, rock crabs, and many other interesting creatures and sea plants / life. The rock and surrounding area is a protected marina garden so no fishing or harvesting of any wild creatures is allowed, but you can take as many pictures as you want and nejoy the area. The rocks rises over 230 feet to the top from the beach below. When the tide is up you can still enjoy lots of visible wildlife, primarily through bird watching the rock is home to the tuffed puffins, gulls, and cormorants among the most common sightings since they make Haystack Rock and the surrounding rock outcroppings there homes.